Step 1 Supreme the oranges and grapefruit: Using a very sharp knife, cut off the top and the bottom of the fruit, so it will sit flat on the cutting board. Starting where you see the orange and grapefruit separate from the white pith, cut away one section of peel and pith, following the line of the fruit. This will expose the underlying fruit. Continue cutting away sections of the peel and pith until only fruit remains. When you're done, go back over the fruit, removing any traces of pith. Step 2 Working over a small bowl to catch the juice, slice the fruit into sections: Make a cut between the fruit and membrane, then do the same on the other side, freeing pure fruit. Repeat until you have removed all the fruit from the membrane. Squeeze any juice from the remaining membrane into the bowl. You will need about 2 tablespoons juice for the vinaigrette. Set the peeled fruit segments aside to use in assembling the salad. Step 3Make the vinaigrette: To the bowl with the juice, whisk in the vinegar, sugar, horseradish and shallot. Slowly whisk in the olive oil, emulsifying to form a vinaigrette. Taste and add one-half teaspoon salt, or as desired. This makes about 1 cup vinaigrette, which will keep, covered and refrigerated, up to 1 week. In Recipes-list.com we have selected the most viewed recipes from category - Salads Sides Vegetarian . Enjoy the best recipes specially selected for you! 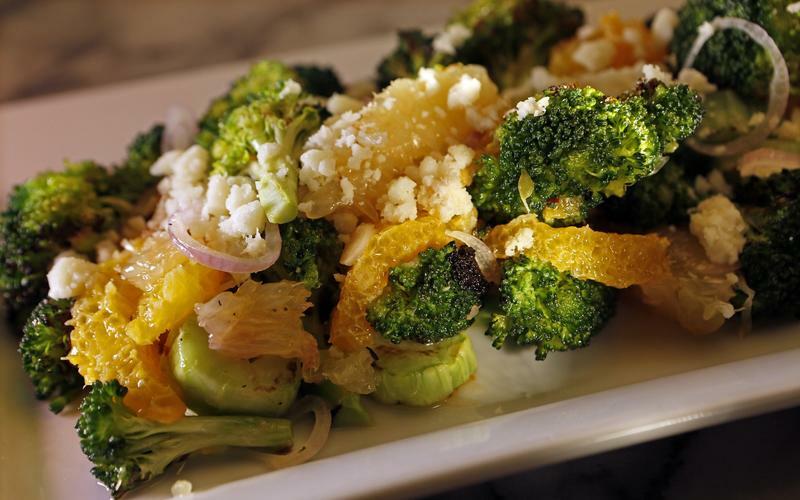 August’s charred broccoli salad is the right choice that will satisfy all your claims.